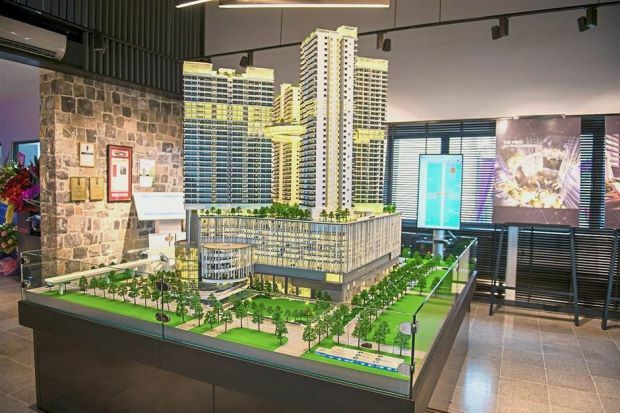 THE Selangor State Development Corporation’s (PKNS) premium development arm, DatumCorp International, has launched its sales gallery at 42, Jalan U Thant, Kuala Lumpur which will feature its first development, Datum Jelatek — an award-winning RM1.2bil gross development value (GDV) integrated development. PKNS’s portfolio includes 11 townships in Selangor, including the state capital Shah Alam, Kelana Jaya, Petaling Jaya, Bangi and Kota Damansara. The sales gallery, an investment of RM4.5mil, will showcase its first project, Datum Jelatek, from the Datum Series, a collection of mid-to-high-end commercial, residential, retail and mixed property developments, which will act as socioeconomic catalysts for surrounding communities. At the launch, PKNS general manager Noraida Mohd Yusof said the development encompasses sustainable practices for environmental, social and business opportunities, and focuses on enhancing residents’ sense of belonging. “DatumCorp International’s first development is the signal of the developer’s commitment to deliver quality, innovation and sustainability in its communities. We are confident that Datum Jelatek’s superior connectivity, strategic location, architecture and value as an investment, will bring about the development’s success,” she said. The event also marked the opening of the pre-registration for the development’s Ayaana Tower, one of its four residential towers, comprising studio units, one-bedroom and two bedroom suites, within 41 stories. Previously, the developer had received a 90% take-up rate for the launch of its first tower, Daneeya Tower, comprising 161 units within 40 storeys. Just 3.5km away from KLCC, one of the rare transit-oriented developments within the area, Datum Jelatek is directly connected to the Jelatek LRT station and is located on Jalan Jelatek. The entire development comprises both retail and residential components. Datum Jelatek offers purchasers an option of four majestic towers spread over 2.3ha. It comprises 708 residential units which are linked to a 317,000sq ft net lettable area (NLA) four-storey retail mall. Each residential tower, architectured to form a lilypad suspended within a ripple of water, has its own identity, with unique design elements and connected by Malaysia’s first “sky-ring” — a circular podium measuring 8.9m in width that will link all four towers at the 27th floor, affording a spectacular view of KLCC. Currently, the development is about 22% complete. The entire development is targeted to be completed in Q2 2019. Prospective residents can select between generously-sized studios, one-bedroom, two-bedroom and three-bedroom suites. Unit build-up sizes range from 550sq ft to 1,600sq ft, and each unit is crafted to exude luxury and sophistication. There is a 1.3ha park on Level 11 and the rooftop cabana offers a 360° view of Kuala Lumpur. Other facilities and amenities include a rock climbing area, private alfresco lounge, synchronised fountain, a fully-equipped audio and games room, a mini putting green, a library, a gym, and a BBQ area. Each residential unit comes with two to four carpark bays, based on the size of units, compared to most developments in the area where only one carpark bay is allocated. There are also six tiers of security, with each of the four towers having its own lobby and security checkpoint. The development is accessible via Jalan Ampang, AKLEH, MRR2 and Jalan Tun Razak. The retail mall, Datum Jelatek Mall, will have a population catchment of 400,000 ranging from income levels of RM7,000 to RM30,000 within the surrounding KL City Centre, Ampang and Setiawangsa. The mall, which is targeted to open in 2018, will feature an excellent selection of F&B stores as well as complementary brands which are non-existent in nearby malls. Datum Jelatek has received a Green Building Index (GBI) certification for its sustainable living features and three Asia Pacific Property Awards, namely Best Residential Renovation/Redevelopment Malaysia, Best Mixed-Use Development Malaysia, and Best Mixed-Use Architecture Malaysia. Besides its lush landscaping and innovative architectural designs, this development is designed with efficient ventilation and promotes natural lighting, and is equipped with a rainwater harvesting system.